Unfortunately, Henry does not practise mindfully so progress is slow when he learns new pieces although, eventually, he reaches the point where his teacher enters him for the next exam. When Henry practises, he is in the habit of simply playing through a piece in the hope that it eventually 'goes right', which involves making and then correcting mistakes. Henry understands the need to play his best in an exam so he tries hard to get the notes right, but he tends to hesitate instead of playing fluently and sometimes he loses his place in the music. When this happens, he asks if may start again but, sadly, he makes the same mistake in the same place. Henry doesn't enjoy playing in exams and he is starting to believe that he is not very good at music. Toby's violin teacher arranges for a pianist to accompany all her higher grade students in exams. Initially, Toby is nervous about how this will work out for his next exam because, so far, he has only ever been accompanied by his teacher. In the first rehearsal, he forgets to include all the lovely, expressive detail that he achieves in lessons. Fortunately, the teacher arranges for the accompanist to rehearse with each of her pupils a few times ahead of their exams. There is a little extra cost involved because, of course, the accompanist must charge a fee for his time but, at the second rehearsal, Toby finds that he loves playing with such an accomplished pianist and he does especially well in his exam. Hayley is the quiet child of unassuming parents who enjoy hearing their daughter's progress but never suggest that she might sing for friends and family in case they think Hayley is 'showing off'. Hayley's performance in her first school concert was a bit surprising, compared with how she sang in lessons. Her teacher knew that Hayley was well prepared but he was disappointed to see no change in her facial expression and to hear little variety in her voice to communicate the meaning of the songs. The teacher realised that Hayley was a naturally introverted child who found it difficult to perform. Firstly, he suggested that Hayley might sing regularly for friends and family. So that Hayley's parents felt comfortable with this, they asked their chosen audience if they would do Hayley a big favour by listening to her singing. The teacher also suggested that Hayley became an actor when she sang, taking on the personality of the different characters in the songs. Well before the next school production, he told Hayley how good it was to show off her skill at communicating the mood and character of the songs. This strategy gave Hayley the confidence to be expressive and her performances became more convincing. I wish I had £10 for every student who has said that to their teacher after playing badly in the lesson! However, it is probably true - that's because when we play for an audience, no matter how small and even if it is just the teacher, a significant percentage of our attention tends to focus on what that person is thinking about our playing, and insidious self-talk thoughts come into our heads, telling us that we might make a mistake. There is a very enjoyable book on just this subject, The Inner Game of Music by Barry Green with Tim Gallwey and The Chimp Paradox by Steve Peters has also become popular for promoting confidence and success. Layla is a percussion player who needs to memorise much of her repertoire. Layla used to be a nervous performer and underachieved in exams, sometimes having memory lapses. Her teacher addressed the problem using techniques that would keep Layla's memory secure under stress and alter her attitude towards performing, including positive imagery and self-talk. Layla's percussion teacher is confident with using these techniques because she is also a qualified, experienced NLP (neuro-linguistic programming) practitioner but, generally speaking, it is advisable for those affected by deep-seated performance anxiety to consult a professional in that specific field. Choice of suitable repertoire is essential for a successful outcome. For a peak performance, a musician should be playing or singing music that is well within her capability, with moderate 'arousal' (stress, anxiety). If the music is very easy and the arousal level is low, such as playing a familiar piece at home, the performance may lack focus and sparkle. If the piece is very difficult and the arousal level is high, such as in an exam, this is when the performance is more likely to fall apart. Wise teachers judge when their students are well on top of the repertoire to be performed, in terms of both interpretative maturity and technical control. Some parents can be a little impatient for their children to progress through the grades but it is important to take the teacher's advice as to when exams are best attempted and at what level. Provide your child with performance opportunities as often as possible to make performing a more ordinary thing to do. Invite friends and family to listen, and talk to the teacher about getting a group of pupils together to play for each other every term. Look for local music festivals to enter - not all of them are competitive. Normalising performing makes it more enjoyable. Your attitude is also significant - talk about being excited, not about being nervous! In relation to concerts and exams, respect the teacher's opinion about your child's current level of musical skill and maturity. 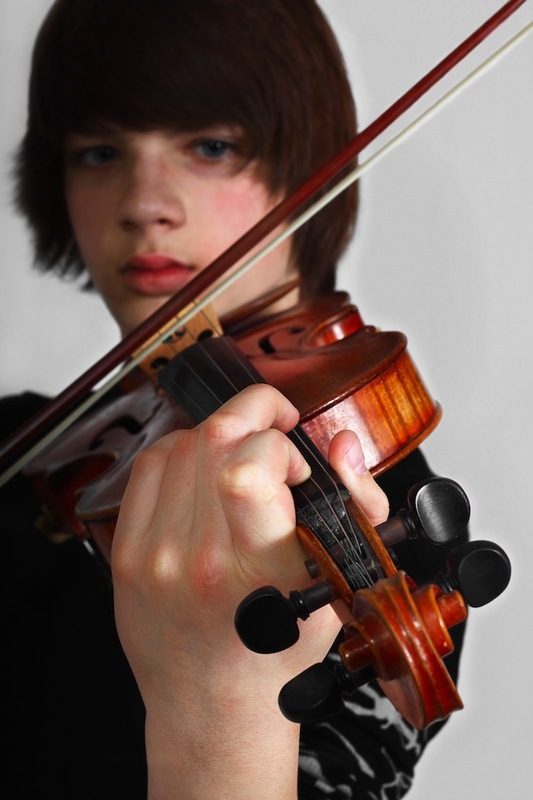 Before an important performance, tell your child that you are confident that she will play musically. Assuming your child has made a commendable effort, praise him ahead of an exam for his commitment to practising and for the progress he has made, and make it clear that you are proud of him whatever the outcome. Beware of offering 'false praise' however - that is, praising unnecessarily in undeserved circumstances, since this can lead to distorted self-esteem and be counterproductive in terms of encouraging children to make an effort with their practice. Above all, encourage mindful learning and sufficient performing practice in the months before the big day - there is nothing like thorough preparation for engendering confidence and success.